Dr. Scott was recently interviewed in Scientific American to comment on a landmark study that revolutionizes our understanding of the complexity of indoor mould ecology. Published in the journal Proceedings of the National Academy of Sciences the Sloan Foundation-funded study collected dust samples from a range of building types worldwide and evaluated fungal communities using cutting-edge, culture-independent, high through-put DNA sequencing. Overall, nearly 4,500 different kinds of fungi were found — an unprecedented amount of biodiversity that exceeds the number of indoor species documented to date by nearly a factor of twenty. 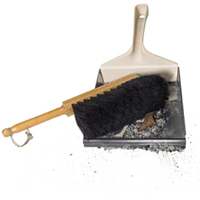 Although the sample set was small, the researchers found that the single most important contributor to indoor fungal biodiversity was geographic location, not building type, construction or usage condition. More surprisingly and perhaps counter-intuitively, the level of indoor fungal biodiversity was found to increase at greater distances from the equator. There is always joy in the laboratory when a brand new mould identification book appears. When the book has hundreds of colour photos to help with fungal identification, it is especially celebrated. Eyes widened around here when we brought in the first copies of Identifying Fungi, by Guy St.-Germain and our own Research Director, Richard Summerbell. This book is so new that its copyright date is listed as 2011. It is the follow-up second edition to the same authors’ highly successful Identifying Filamentous Fungi from 1997. It differs from the previous edition not just in being updated with all the new fungal names and new clinical and ecological information, but also in documenting the major medically important yeasts for the first time. The well illustrated sections on ‘Methods’ and ‘Culture Media and Stains’ have also been upgraded to include yeast-related information alongside recently developed practical methods for filamentous fungi. The only molecular techniques documented are the few that are well established as part of the medical mycology routine, e.g., probe tests for dimorphic fungi. This 377-page book includes 239 pages of illustrated descriptions of medically important fungi plus all the common airborne fungi that grow as contaminants from biomedical samples. 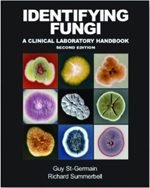 Some important genera such as Aspergillus and Trichophyton have species-level descriptions, but this is predominantly a book for identifying fungi at the genus level. There are dichotomous keys to the genera, plus an illustrated key based on colours and shapes. The descriptions themselves emphasize easy-to-read bullet points. The book also includes an explanatory introduction, a glossary of terms, information on safety and quality control, and extensive documentation of methods. A bibliography of advanced and alternative literature is given. Clade associations are noted for each species to help those who need to interpret molecular results (e.g., GenBank blast searches). The robust binding is made to allow the book to lie flat on the benchtop, facilitating use. What looks like it should be a $175 technical book actually sells for under $100.